The George, a luxury boutique hotel, is the essence of supreme comfort and is renowned for offering a personalised stay and attentive staff as well as two award winning restaurants. 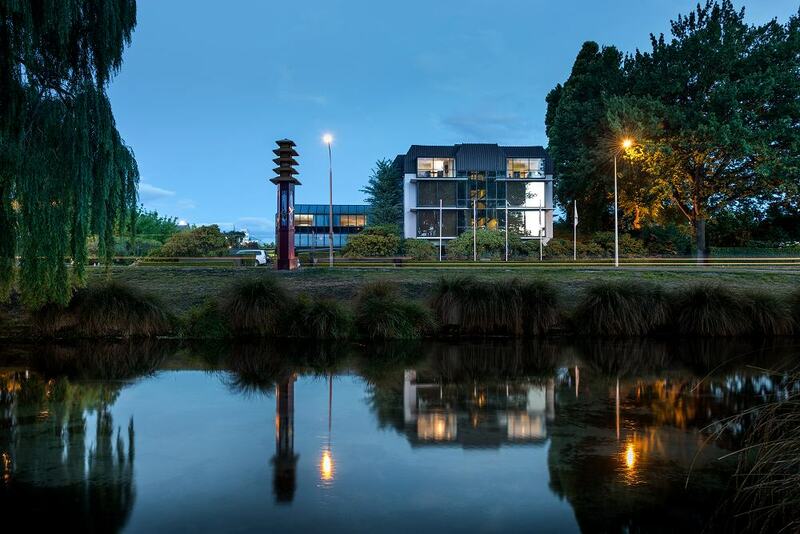 Located in the heart of Christchurch overlooking the picturesque Hagley Park and river Avon you will find peaceful Christchurch accommodation just steps from the cultural precinct and key attractions. Impeccable service in an intimate ambience is guaranteed at The George, the only Christchurch Hotel with a one-to-one staff to guest ratio. Enter the luxurious world of fine dining in Christchurch's most exclusive hotel, The George. Here, Executive Chef Andrew Brown and his team, delight with their skillfully prepared innovative cuisine at two award-winning restaurants, 50 On Park Restaurant and Bar and Pescatore. With a range of function rooms The George is an ideal conference venue and also excels as a wedding venue. With beautiful gardens, fabulous location, attentive service and stunning food, The George is one of Christchurch's top wedding venues. The George tops the list of Christchurch Hotels and is the only Christchurch Hotel that is a member of Small Luxury Hotels of the World. The George was recognised as 'New Zealand's Leading Boutique Hotel' 2006, 2007, 2008, 2009 & 2010 in the World Travel Awards, one of Oceania's top 20 Hotels in the 2009 Conde Nast Readers' Choice Awards and voted #1 in New Zealand by Travel + Leisure 'World's Best Hotels Survey' 2010. Situated overlooking Hagley Park and the Avon River, The George is in the heart of the arts precinct just steps away from Christchurch’s centre and 15 minutes from the Airport. Nearby attractions include Canterbury Museum, Botanic Gardens, Punting on the Avon, Hagley Park Golf Course, Restart Mall and the Christchurch Casino. It is also around 1 hour from the quaint French settlement of Akaroa and the boutique vineyards of Waipara. The George offers 2 beautiful venues to choose from; the stunning romantic private garden of The Residence, a private house adjoining the Hotel, and Parkview which offers spectacular views of the Avon River and Hagley Park, or you can opt for exclusive use of both areas. For more intimate gatherings the residence dining room and cocktail area combined with the garden and is the perfect venue to indulge yourselves and your guests. Your choices don’t end there as our team work in consultation with you to design a wedding tailored to meet your specific requirements. From menus, to wine selections, and table dressings, a wedding at The George reflects your choices and personality. Superb catering is a hallmark of our award winning restaurants, our Executive Chef, Glen Cooper, maintains these same standards to the menus designed for you and your guests. The George can seat up to 90 guests and can provide accommodation for both the wedding party and guests. Another bonus is abundant free car parking allowing easy access for your guests. Only at The George can you enjoy the flare and style of our award winning chefs. And, as you would expect, The George’s renowned service and attention to detail will complete the picture.